The Model 520 program timer has multi-connection plug-on termination for quick wiring hook-up. 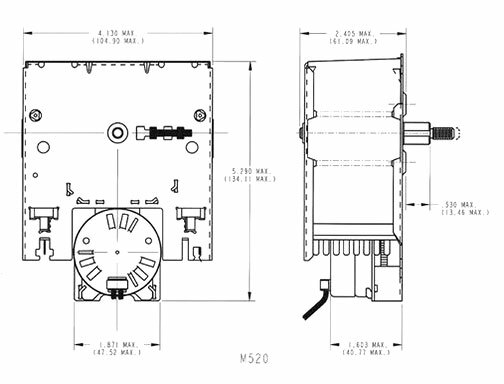 Up to 16 single-pole, single-throw (SPST) or single-pole, double-throw (SPDT) 15 ampere, 1/2 HP switches are available. Two sub-interval circuits, one isolated, are optional. A shaft-operated line switch, with an optional ramping feature to reset, is also available. Other options include a positive shaft-setting stop, shaft detent, rapid-advance motorized shaft indexing, delayed start and a variety of drive systems ranging from constant speed to the MTS Variflex incremental advance drive for the most complex application requirements. The Model 520 electromechanical timer has versatile applications such as domestic washers and dryers and commercial laundry. Multi-connection plug-on utilizing .125" (3.175) male spade terminals. 15 minutes to 3 hours cycle time with up to 6 hours of "delay" time. Permanent magnet, 24 VAC, 115 VAC or 230 VAC nominal voltage inputs at 50 Hz, 60 Hz or 50/60 Hz. Motor leads 4" (101.6) long with .187" (4.75) strip standard. Quick connect terminals optional. .250" (6.35) x 1" (25.4) standard. Others available. Commercial laundry, laboratory cleaning equipment, dairy equipment, domestic clothes washers and dishwashers.